Injera is a sour flatbread used in Ethiopian and Eritrean cuisine that is thicker than a crepe but thinner than a pancake and has a delightfully sour taste. In Ethiopian and Eritrean cuisines, vegetable, lentil, or meat dishes are served on top of the injera, and the food is eaten with your hands, using the injera to scoop up the food. While traditional injera uses all teff flour, most Injera recipes in the U.S. use a combination of teff and wheat flours, which may be why I prefer this recipe's result, which uses all-purpose flour with teff flour. In a large mixing bowl, combine the flours and salt until well mixed. Add the water, stirring until combined. Cover loosely with a paper towel and let stand, undisturbed overnight. Gently agitate the mixture with a wooden spoon in the morning (there should be bubbles already forming on the surface, and the fermenting water should have risen to the top). Cover again and let stand at room temperature, undisturbed overnight. Repeat this cycle once more. 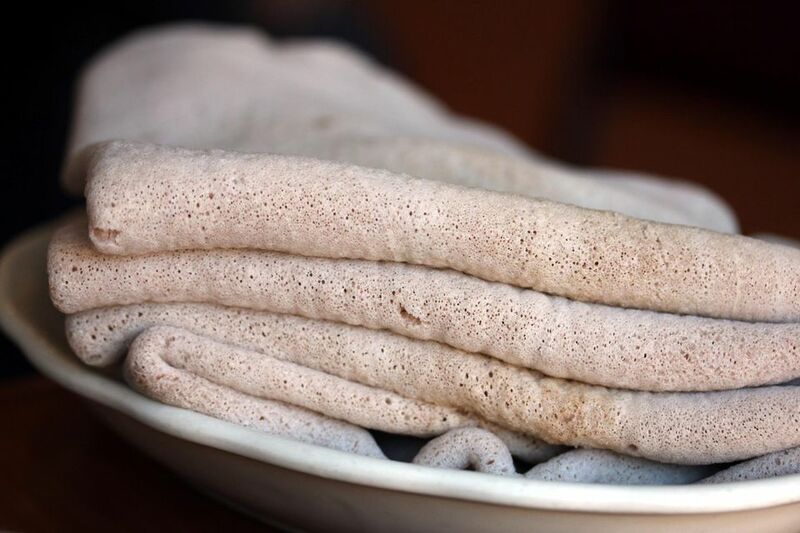 After 3 to 4 days, your injera should smell sour and be very bubbly, which means that it's ready! Stir the mixture until combined. Heat a large, lightly-oiled heavy-bottomed skillet over medium-high heat. Add about 1/3 cup of the batter to the skillet, forming a thin layer of batter over the pan. Cook until bubbles form on the entire surface of the flatbread (do not flip; only cook one side like a crepe). Using a metal spatula, remove the injera and transfer to a plate. Repeat until all of the batter is used, adding oil to the skillet as necessary. Serve with spicy vegetables, lentils, or meat dishes of your choice.